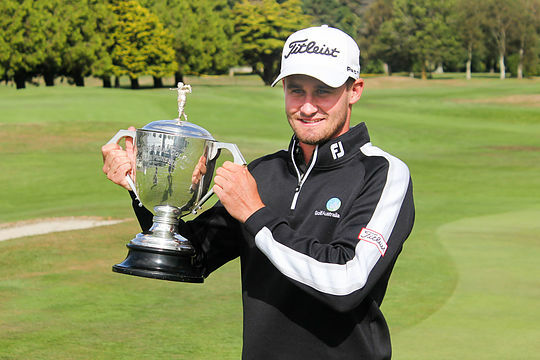 Jarryd Felton has won the Lawnmaster Horizon Golf NZ PGA Championship in a thrilling playoff against Victorian Josh Younger and New Zealand’s Ben Campbell. Felton, Campbell and Younger all finished 14-under 270 at the end of four rounds of stroke play to force a trip to the 18th tee for a playoff. The West Australian drove wide from the tee but was able to quickly rally and make birdie to seal the win. “I didn’t hit too good of a tee shot, I think I got pretty lucky actually. I capitalised and made the putt, I don’t think the Kiwi fans were too happy,” laughed Felton. This is Felton’s second win on the ISPS HANDA PGA Tour of Australasia, his first came in 2015 when he won the NSW PGA Championship in just his fifth start as a Professional. The 21-year-old said this win is his biggest achievement to date in his young career. The win gives Felton full exemption on the ISPS HANDA PGA Tour of Australasia for the remainder of 2017 and entirety of 2018, allowing him peace of mind for the rest of this season. “Obviously we’re trying to keep our job at the end of the year, I finished really well in the money list last year, 18th I think on the Order of Merit, so I got a pretty good exemption category this year. Ben Campbell was awarded the Sir Bob Charles trophy for finishing the leading New Zealander in the field. “I obviously would’ve much rather have both trophies, but silverware is silverware,” Campbell said. With the ISPS HANDA New Zealand Open to be played virtually in his backyard next week, Campbell said he’ll look forward to carrying his form over. Campbell finished T2 with Josh Younger while Matthew Giles (NSW) was outright fourth. New Zealand trio Harry Bateman, Gareth Paddison and Shaun Jones were T5 with Brad Kennedy (QLD), Ben Clementson (NSW) and Anthony Quayle (QLD) rounding out the top-10. The ISPS HANDA PGA Tour of Australasia now heads to Millbrook Resort for the ISPS HANDA NZ Open please visit pga.org.au for the details and the full Tour schedule. With this win Felton sits 23rd in the ISPS HANDA PGA Tour of Australasia Order of Merit.